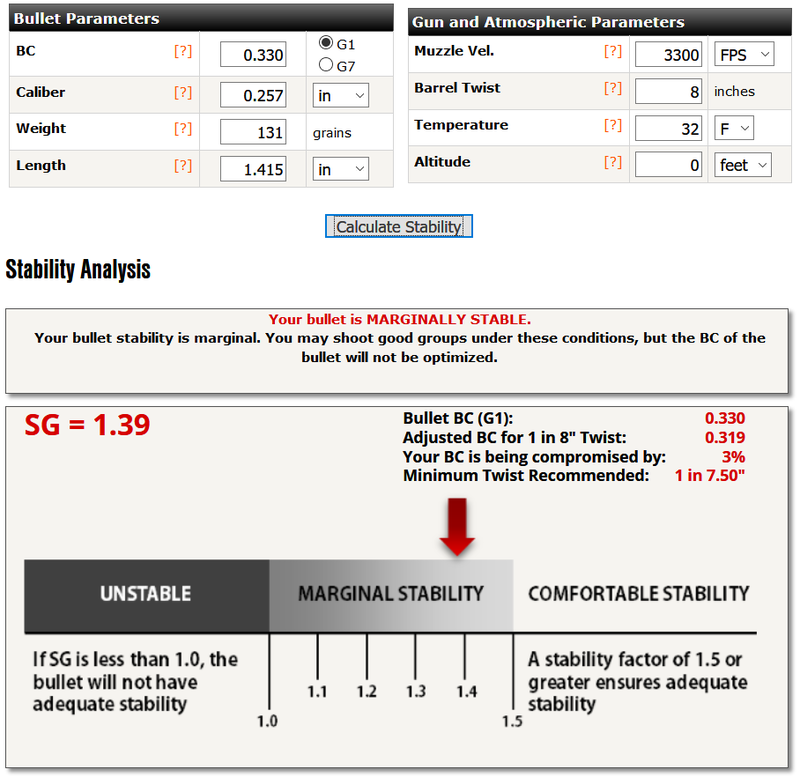 We’ve received a lot of Private Messages and Emails about stability since we announced our 131 grain Blackjack bullet in 0.257″ and the length of 1.415″. They scenarios range from 1:10″ twist 25 STW’s for mountain hunting to 1:10″ 257 Roberts out in desert flats. Unfortunately there haven’t been many rifles built with fast twist rate 25 Caliber blanks, so I wanted to put together a series of pictures showing how Muzzle Velocity and attempting to control Bullet Stability Factor by pushing your hand-loads faster and faster really does not help as much as people think. Having a gunsmith replace the 1:10″ twist barrel with a 1:7″ to 1:8″ twist does and you’ll have consistent BC and downrange results as you travel around the country for big hunts or shooting competitions. 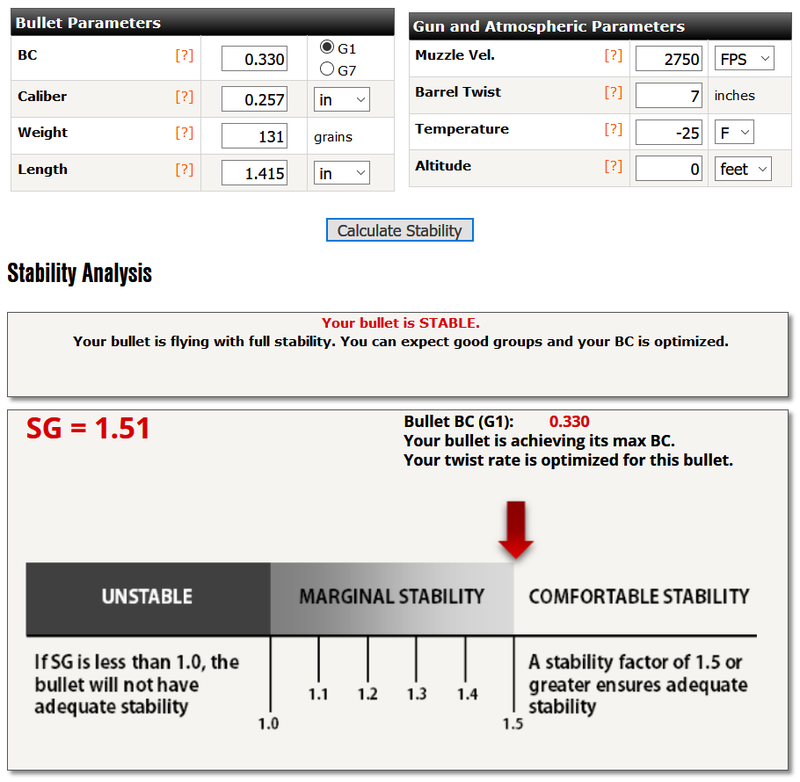 Below is a laundry-list of Stability Factor & BC effects from running different twist rates and velocities. By the end of this post it should be apparent a 1:8 twist will work quite well for Magnums over 3300 fps and 1:7.5 twist will work for nearly any other set of 257 cartridges. 1. Let’s start off with the Magnums and Super Magnums (257 Weatherby, 257 STW, 25 Nosler, 25-300 Norma, etc). – Take a guy in the lowlands anywhere in the US around 1000′ altitude. He knows he can run these 131 grain bullets 3300 FPS in his 1:10″ twist magnum rifle. That ought to be fast enough, right? Nope. 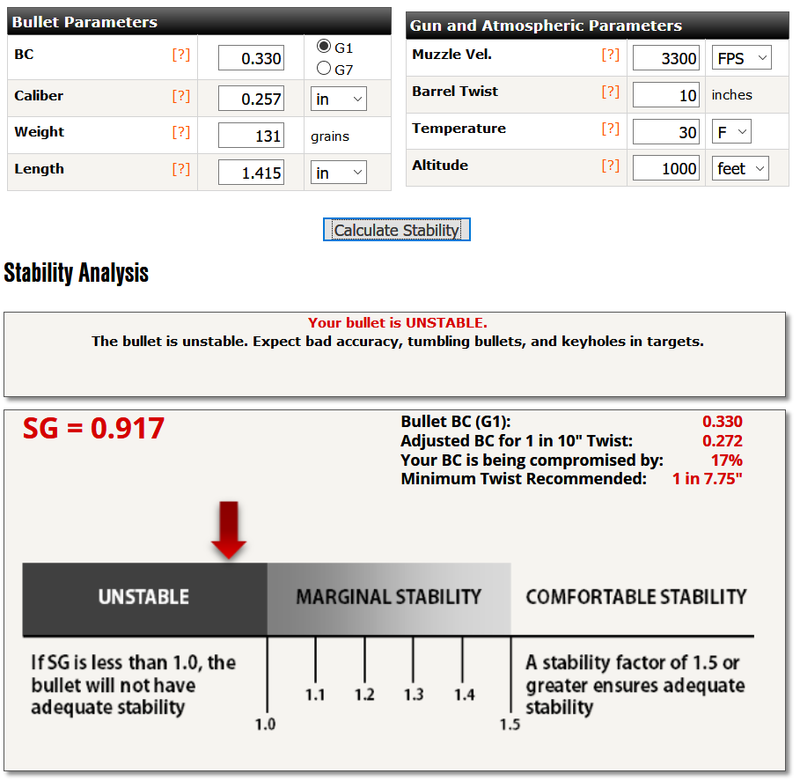 Using a standard 1:10″ at 3300 fps the combination doesn’t even enter into “Marginal Stability” at 1000′ altitude and 59°F – likely to see obvious accuracy issues like Keyholing at 100 yds. A lot of times this is where guys think speeding the load up may help. 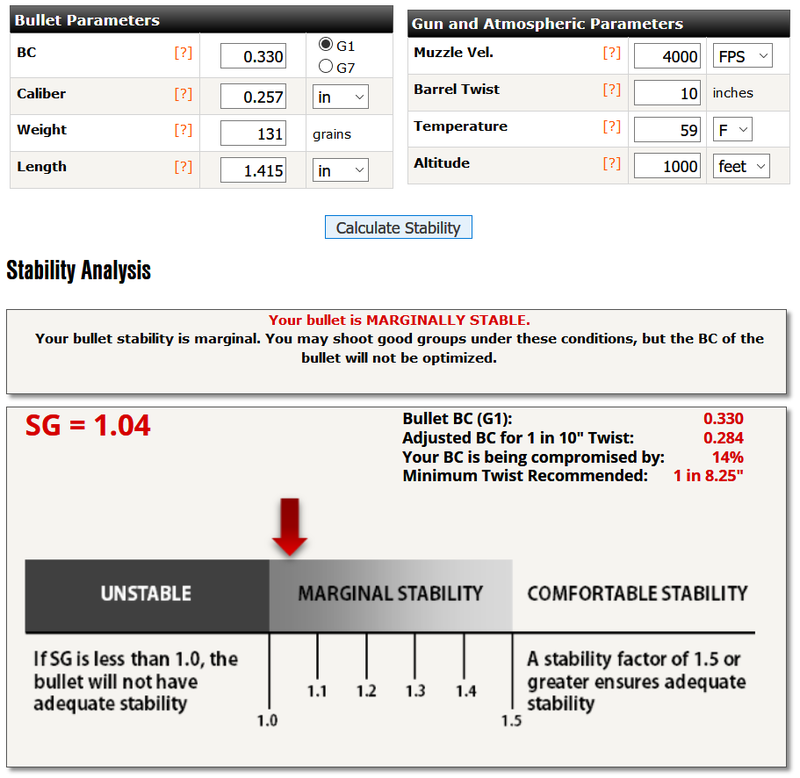 Will the bullet now be stabilized in the same conditions at 59°F and 1000′ altitude? Check out the graph below. Increasing MV by +700 FPS only brought the bullet into Marginal stability where the rifle may group accurately but it is suffering 14% BC loss. Add a Cold Front blowing through or heading downhill a little ways and your rifle is shooting like a shotgun again! Here come’s the Cold Front and now your 4000 FPS rifle went from Marginal Stability back to UNSTABLE. – Well, what if we take that 3300 FPS load up in the mountains to see how it will do in higher Elevations like 7000′? Again, we only enter Marginal Stability with a 10% decrease in BC. Like the 4000 fps setup with Marginal Stability we are only a Cold Front away or a hike downhill before we enter the UNSTABLE zone again and likely to miss whatever we’re aiming at. – It’s about time we start thinking about putting a “fast twist” barrel on this rifle isn’t it? – So, let’s head in the the gunsmith and chamber up a 1:8″ twist blank. Boom! Just like that you are Fully Stable and enjoying 100% of the bullet’s BC. – Let’s take a stroll down to the beach in a solid Cold Front (0 altitude & 32°F) with the 3300 fps rifle and the 1:8 twist barrel that was 100% stable at 59°F and 1000′ altitude. Well, we lost 3% BC but our rifle is still shooting lights out. With this 1:8″ twist 0.257″ blank the environmental changes from weather and travel aren’t too worrisome at all. #2.) Match Rifles – Let’s cut straight to the chase. You want your Match Rifle to perform 100% and consistent no matter where you go or what conditions you find yourself in. – You’ve crunched the numbers for all your Matches that ranging from Core Shooting Solutions near Crestview, Florida (236′ Elevation) to Telluride Colorado (8750′ Elevation) and that Alaskan Blacktail hunt you want to take on one of the islands full of giant bears (freezing temps and near sea level). You want across the board CONSISTENCY so you chamber up a 1:7.25″ twist 0.257″ blank and run it nice and easy at 2850 fps. Well, the good news is when you find yourself standing on the beach next to the water and the temperature outside is ZERO DEGREES your barrel and bullet combination is FULLY STABLE. 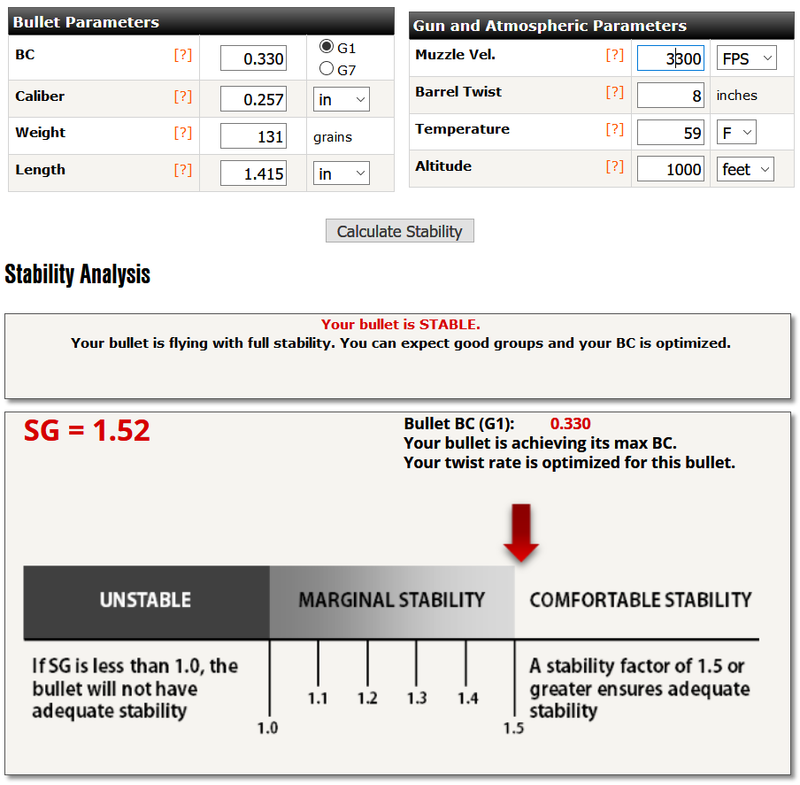 You can travel anywhere down to 0°F without the slightest worry about stability issues or BC loss. – For some of you folks who have the pleasure of living in the really, really cold places on earth a 1:7″ twist barrel may suit your needs as it can handle -15 F and -25F with complete confidence in your BC. I’ve hunted in -17 F for a few days and let me tell you, bullet stability was not the first thing on my mind. 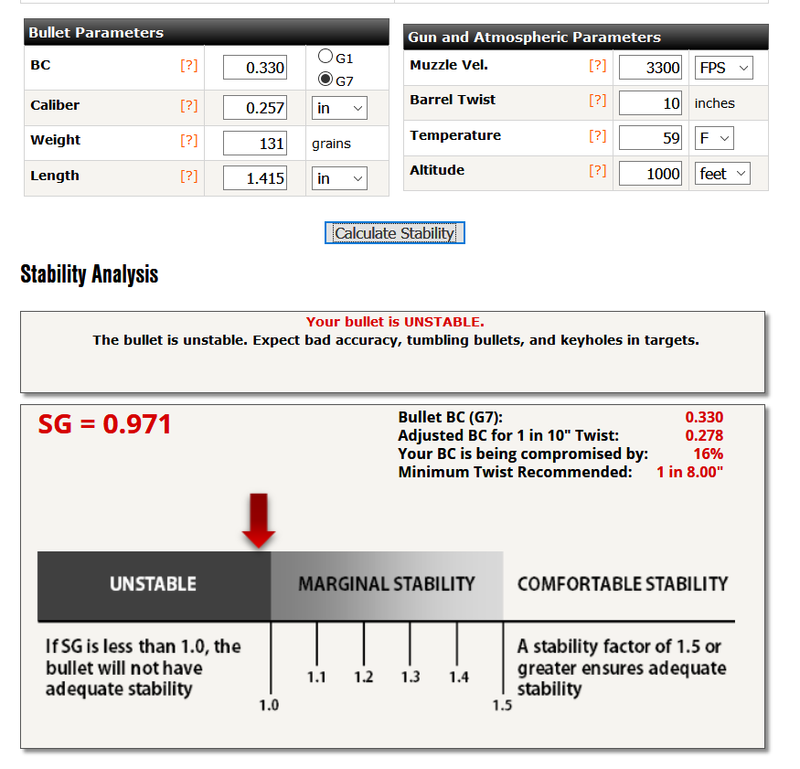 Now all of this was probably a bit overkill, but I wanted to lay some of these scenarios out since there is still some mystique about Bullet Stability and many guys still chase velocity thinking it will cure their accuracy problems. 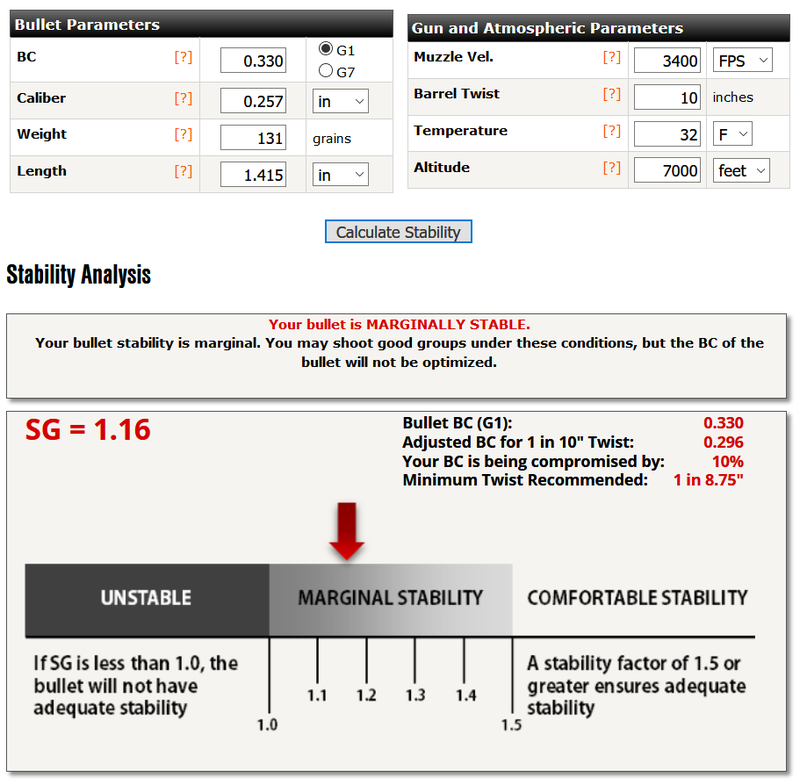 The 1:10 barrels guys may try to shoot heavy and long bullets from might work in some places on some days, but it should be apparent that if you want consistent ballistics and success on your hunts and competitions, use an appropriate twist barrel. We will be stocking 1:7″ and 1:7.25″ twist blanks from Bartlein, Krieger, Lilja, and Rock Creek starting late June 2018! To purchase one check this link on June 27th when we begin to take pre-orders for some of the blanks! Thanks for checking out Blackjackbullets.com! Next post: 131 ACE STURGIS Tee Shirts are in stock for XL and XXL! Very interested in a 1-7.25 twist Savage pre-fit barrel in 25 Creedmoor if it is at all possible. Michael, please get in contact with Travis Stevens at TS Customs and he will get you rigged up. If we need to send him the barrel of your choice that will work great. He is a top notch smith and 2nd to none. His turn around times are better than most shops too! Please purchase one of our blanks and have it sent up to Travis Stevens at TS Customs. He does superb work and has short turnarounds. We can ship directly to TS customs for you.